With Mother’s day on Sunday, we thought it was the perfect time to update you on My Mom Will Walk Again: A Daughter’s Courageous Fight for A Cure. 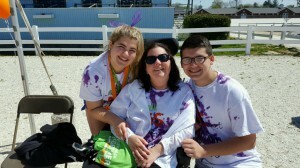 Rachel Weber, a local high school senior has been raising money every year for the annual MS Walk for a Cure. Her mom was diagnosed with multiple sclerosis 13 years ago and now that she is older, Weber has raised money to support the Multiple Sclerosis Society’s efforts to find a cure for this debilitating disease. Multiple sclerosis is a chronic, typically progressive disease involving damage to the sheaths of nerve cells in the brain and spinal cord, whose symptoms may include numbness, impairment of speech and of muscular coordination, blurred vision, and severe fatigue. Weber, the daughter of Devon International Group’s Chief Financial Officer Bradley Weber, started her quest for a cure when she was a freshman in high school after seeing a commercial for the walk. The walk was held last Sunday April 24th at the Devon Horse Show in Devon, PA and was a smashing success. Weber’s team, Team Sweet Carolyn, named after her mom Carolyn and her favorite Neil Diamond tune, “Sweet Caroline,” had a goal of raising $10,000. To date, they have raised a whopping $9,685 to go towards MS research. Bradley Weber said that the organization typically leaves the fundraising open after the walk so that participants can still donate to the cause. He projects by the time the fundraising closes; they will have well exceeded their goal. “The walk was a huge success! Team Sweet Carolyn was the largest team that participated and as of today they are in second place for the most amount of money that was raised,” Brad said. Rachel’s team was sponsored by Devon Medical Products, a medical device distributor and manufacturer, and subsidiary of Devon International Group. If you would like to donate to Team Sweet Carolyn, please visit their team website for more information.